Among the more than two thousand arches in Arches National Park, Delicate Arch, chosen by the state of Utah to be its symbol, is distinguised by its graceful shape and location above a curving slickrock basin with the La Sal Mountains as a backdrop. 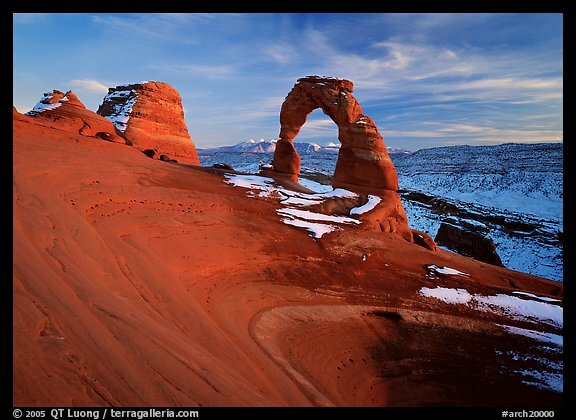 Even if your stay in Arches is brief, you shouldn’t miss Delicate Arch. 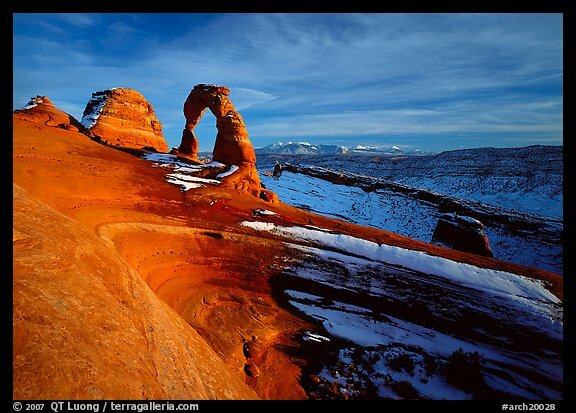 I much prefer to photograph Delicate Arch in winter, for three reasons. First, during the winter months, the La Sal Mountains are snow-covered. Second, since the Arch is south-facing, during the winter, it is entirely lit by the last light of sunset. The warm color of the sunset light enhances the natural color of the Arch, causing it to glow with a color that is almost surreal. On the other hand, during the late spring and summer months, part of the Arch is in shadow at sunset, so you’d have to photograph it at least half-an-hour before sunset, when the light isn’t as great. Last, Delicate Arch is a popular sight, so at the height of the visitation, it can be difficult to get a photograph without someone posing beneath the span. The trail to the Delicate Arch is a mile-and-a-half long, with 500 feet of elevation gain. It takes about 45 minutes to hike one way. To give yourself enough time for photography, you should allow for at least three hours for the round trip. The trail is marked by cairns and by the wear left by generations of visitors on the slickrock. Although obvious by daylight, it requires much attention by dark, especially in winter, when the last hundreds feet of the trail are often frozen. Since you may be descending after sundown, it is essential to take a good light. There are not a lot of variations in viewpoint, as there is a vertical cliff beyond the Arch. Yet, by using either a short tele or a wide angle lens, and by photographing from the rim or from below, you can include or exclude the mountains or the bowl. Some photographers time their visit so that the moon can be framed within the Arch. Others use a double exposure to include the moon – which doesn’t prevent their image from appearing on the cover of Outdoor Photographer. On the way to Delicate Arch, there are two sights worth noting. After you cross the suspension bridge over Salt Wash, turn left on a secondary trail along the dry bed and walk for about a hundred feet to a fork, then turn right. You’ll see a nice panel of Ute petroglyphs. Near the summit, close to Delicate Arch, there is a small arch on your right that can be used to frame Delicate Arch (as Galen Rowell did). On my second visit, during a frigid late November evening, other hikers took a quick look before heading back. As I stayed in the biting wind, the last light intensified the colors of the red entrada sandstone rock, contrasting it with the blue colors of the snow-covered slope behind. By the time I returned to the parking lot, everybody had left. While the temperature had dropped to single digits, my car battery had died, but my expedition-grade sleeping bag kept me warm for the night. I was glad I was well-prepared for winter travel ! Posted on December 17, 2009, 1:04 am, by QT Luong, under National Parks Photo Spots. QT, thank you for such good information on Delicate Arch–Knowing when to photograph is as important as knowing about the place itself. Especially appreciated is the information regarding the trail, and the hazards one can face in winter after dark.